Greece begins to return migrants to Turkey Jump to media player Ferries taking migrants from Greece to Turkey have arrived in the Turkish town of Dikili, as Mark Lowen reports. Migrants wait for asylum in Lesbos camp Jump to media player Greek coastguards have rescued a boat full of people off the island of Lesbos. 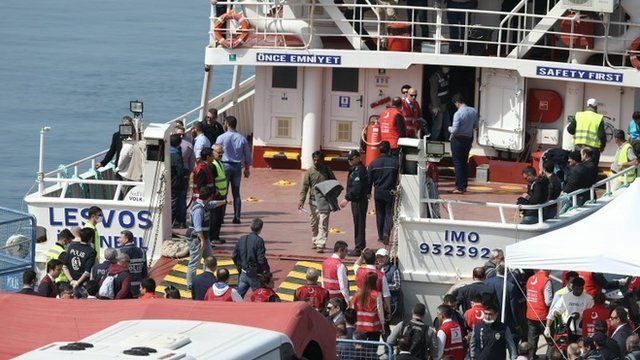 Turkish ferries to transport migrants Jump to media player There is growing concern over a lack of preparation for the plan to send migrants back from Greece to Turkey, two days before it comes into effect. Syrian migrant: 'Deportation is a big mistake' Jump to media player The Greek parliament has passed a law allowing migrants arriving in the country to be returned to Turkey. The first boats carrying migrants to Turkey from Greece, under a controversial EU deal, have arrived in Dikili, Turkey. The ferries had earlier left from the Greek port of Lesbos, just 30 kilometres from Dikili. Mark Lowen was in the Turkish town as the boats started to arrive.